News Photo by Kim Lewis ELCE Convention, Trade Show, Awards Banquets: 'A Success by Any Measure' Winners in two Elearning! Media Group (EMG) national competitions — the Learning! 100 and Best of Elearning! — were announced at the second annual Enterprise Learning Conference & Expo (ELCE) in August at the Anaheim (Calif.) Convention Center. For the frst time in ELCE's short history, it shared the venue with the California HR Conference, produced by the Professionals in Human Resources Association. ELCE 2013 was the largest HR, talent and learning technology conference, outside of SHRM National. Attendees were treated to seven keynote addresses, more than 60 individual educational sessions, more than 200 exhibitors, and two awards banquets. "By any measure, this was the most successful ELCE that EMG has produced," said Elearning! magazine editorial director Jerry Roche. "Not only were the presentations top fight, but industry participants were among the brightest and best that the learning community has to offer." An added bonus to the conference were Master Classes on Mobile Learning, Measurement, Sales Growth, Gamification, E-learning, LMS/TMS Selection, and Video Learning! 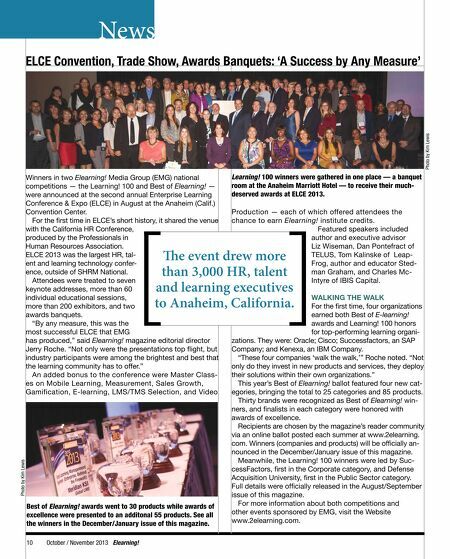 100 winners were gathered in one place — a banquet room at the Anaheim Marriott Hotel — to receive their muchdeserved awards at ELCE 2013. Production — each of which offered attendees the chance to earn Elearning! institute credits. Featured speakers included author and executive advisor Liz Wiseman, Dan Pontefract of TELUS, Tom Kalinske of LeapFrog, author and educator Stedman Graham, and Charles McIntyre of IBIS Capital. Photo by Kim Lewis Te event drew more than 3,000 HR, talent and learning executives to Anaheim, California. Best of Elearning! awards went to 30 products while awards of excellence were presented to an additonal 55 products. See all the winners in the December/January issue of this magazine. 10 October / November 2013 Elearning! WALKING THE WALK For the frst time, four organizations earned both Best of E-learning! awards and Learning! 100 honors for top-performing learning organizations. They were: Oracle; Cisco; Successfactors, an SAP Company; and Kenexa, an IBM Company. "These four companies 'walk the walk,'" Roche noted. "Not only do they invest in new products and services, they deploy their solutions within their own organizations." This year's Best of Elearning! ballot featured four new categories, bringing the total to 25 categories and 85 products. Thirty brands were recognized as Best of Elearning! winners, and fnalists in each category were honored with awards of excellence. 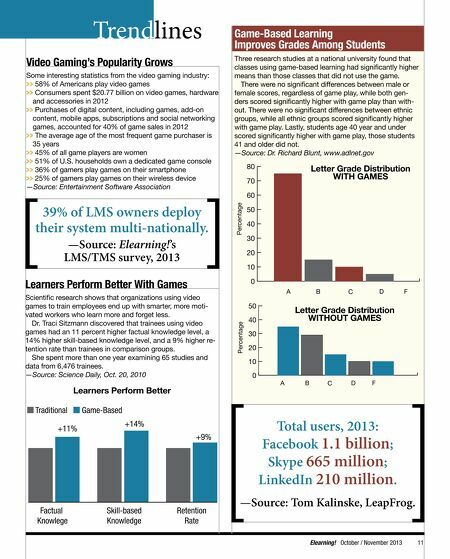 Recipients are chosen by the magazine's reader community via an online ballot posted each summer at www.2elearning. com. Winners (companies and products) will be offcially announced in the December/January issue of this magazine. Meanwhile, the Learning! 100 winners were led by SuccessFactors, frst in the Corporate category, and Defense Acquisition University, frst in the Public Sector category. Full details were offcially released in the August/September issue of this magazine. For more information about both competitions and other events sponsored by EMG, visit the Website www.2elearning.com.